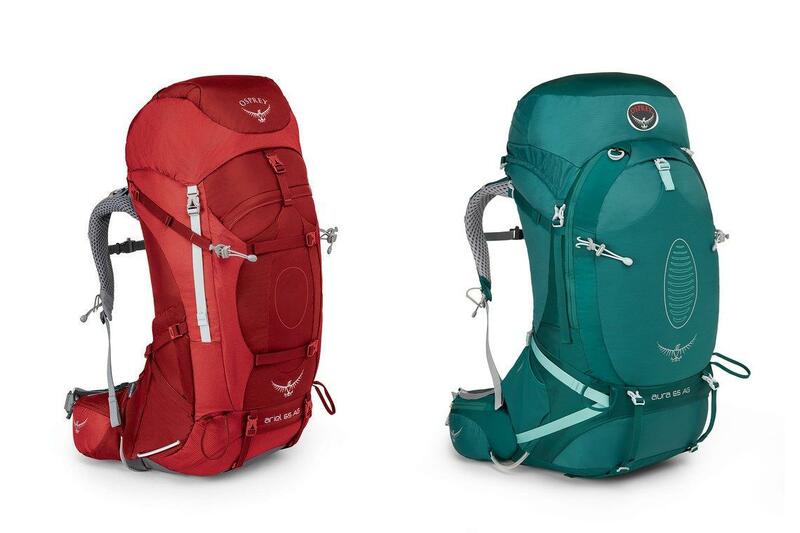 >> Osprey Ariel vs Aura – Which Women’s Pack? Osprey Ariel vs Aura Backpack Comparison – Which Is the Best Women’s Hiking Pack? Osprey is a leading producer of hiking backpacks for both men and women. The Ariel and Aura are two of the more popular options for women and they share many similar features. If you need to choose between these two backpacks, compare the features, advantages, and disadvantages. The Osprey Ariel and Aura hiking backpacks are built for women. To accommodate narrower shoulders, women’s hiking backpacks are not as wide. The slimmer design is more comfortable for people that do not have wide shoulders and ensures that the backpack remains firmly in place. Both bags are constructed with durable materials. These materials should shield against rain and hold up to regular use. The lighter backpacks vary in size, while the larger backpacks offer the same load capacity. Regardless of the size that you choose, you will find many of the same features, this includes fully-adjustable straps. The harness and shoulder straps can be adjusted to perfectly fit any frame. These backpacks also include additional lumbar support with incredible ventilation. You will also find an interesting feature on both the Ariel and Aura. Both backpacks include a removable flap for the main compartment. This removable section is called the DayLid and works as a separate pack when removed. The smaller pack can be used to store a smartphone, wallet, and keys when you do not need the entire backpack for part of your trip. Another feature that is included in both the Osprey Ariel and Aura, is a sleeping bag compartment. This keeps the sleeping bag separate from the main compartment. Both backpacks also have a hydration sleeve. These hydration sleeves are designed to work with the Osprey Hydraulics reservoirs. With the hands free hydration system, you can hike without having to take your water bottle out every time that you need a sip of water. Most hiking backpacks include loops for attaching extra gear, such as trekking poles and ice axes. If you use these items during your hikes, you will want a backpack that includes the attachment points. You get the attachment points for trekking poles and ice axes with both the Osprey Ariel and Aura. If you have looked at Osprey hiking backpacks before, you have probably seen this next feature. Both backpacks are equipped with the sternum strap that doubles as an emergency whistle. The strap keeps the shoulder straps from shifting, while the emergency whistle may come in handy if you need to call for assistance. There are also several differences between these two backpacks. The Ariel includes access to the main compartment through the top and front of the bag, while the Aura only includes top access. The additional panel included in the Ariel provides more options for getting into the main area of the backpack. However, the Aura includes a few extra features that may set it apart. The Aura has an extra pocket compared to the Ariel. It also has slightly more space and comes with a rain cover. The rain cover is 100% waterproof and can protect your items when hiking in severe weather. The Aura is also slightly lighter than the Ariel. However, the weight difference is negligible. This may not impact your buying decision unless you need to consider every ounce of your load. The Ariel includes two additional compression straps. The additional straps can help ensure that the backpack is secure against your body, preventing the bag from shifting on your back. The Ariel and Aura also includes a hip belt for improved support and stability. Conclusion – Which Backpack Should You Get? Both backpacks are wonderful options for any woman. The Osprey Ariel and Aura backpacks are well built, durable, and provide all the features that you expect in a quality hiking backpack. There are pros and cons to both backpacks. In the end, your decision may depend on the features that matter most to you. If you want additional pockets and storage space, you may prefer the Osprey Aura. This is the slightly lighter backpack that includes more zipped pockets. The Osprey Ariel features more stability, thanks to the extra compression straps. If you want comfort, choose the Ariel. If you need more space and organization, consider getting the Osprey Aura.